Just another "yeah yeah, what ever" story. Yeah, It's another media "beat-up". It's not going to happen anytime soon. Don't believe anything until Disney release the information officially. If ever there was a succinct definition of a sweet deal, surely this is it. It may be recalled that before Disney signed its contract with the Hong Kong government it attempted to reach agreement with the Queensland state government for an Australian park. land grants and tax breaks worth just over US$500 million. The Queensland Premier Peter Beattie said, "only Goofy would have picked up such a deal." 2005 - Disney Execs tour Gold Coast, then Sydney and Avalon Cut to five years later HK Disney is almost done and Disney are back. THE Gold Coast could be in line for another major theme park after rumours emerged the State Government was negotiating with the global entertainment giant Disney. would have been based on land at Coomera. "Mick Veivers was in the US as sports minister and he met with Disney's head officials," he said. However, the state missed out on Expo by one vote and the park fell off he map. "To the extent it is being revisited by the Beattie Government is great news," said Mr Borbidge. A spokeswoman for Disney said the company was evaluating various markets around the world but it was unlikely anything would be considered before September, when Disney opened an amusement park in Hong Kong. Dreamworld chief Stephen Gregg said while any new theme park was speculation at the moment, a competitive market was a good market and Dreamworld would welcome Disneyland if it set up on the Gold Coast. "At the moment I'd say Disney is focusing on their September opening in Hong Kong so whether it happens or not, we're certainly a few years away from Mickey Mouse in the Sunshine State." Early 2006 - Avalon drops out Here is confirmation that Avalon dropped out of the competition in 2006 (IMO never a serious option), from an article titled: "Avalon chief vows to pursue retail hub `Give DFO a go'" from 2006. "...But don't expect Disneyland to figure in that (Avalon) plan, despite confirmation that Mr Fox held informal talks with key Disney personnel about an Avalon-based theme park. He said there was no commitment from Disney and no current plans for the idea to go ahead." speculation Australia's first Disneyland may be heading for the Gold Coast. The Disney organisation, the world's premier theme-park operator, has been the target of regular speculation about heading for Queensland. 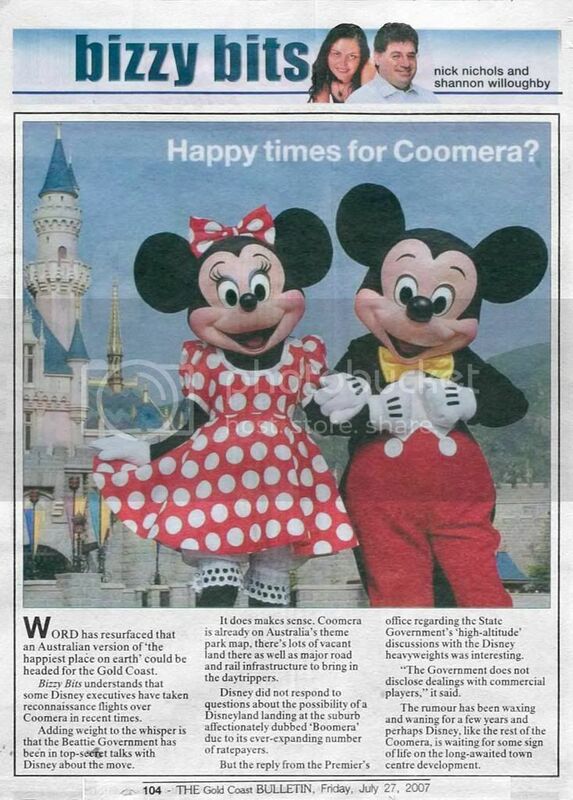 In the mid-90s, the Borbidge Government was schmoozed by the Disney people about the prospect of a suitable Queensland site including Coomera. Disney sites in the US are backed by others internationally including Eurodisney in France and its latest venture in Hong Kong. Just for all you who are wondering,it has been known for some months now that Disney have bought a lot of land on the Gold Coast. 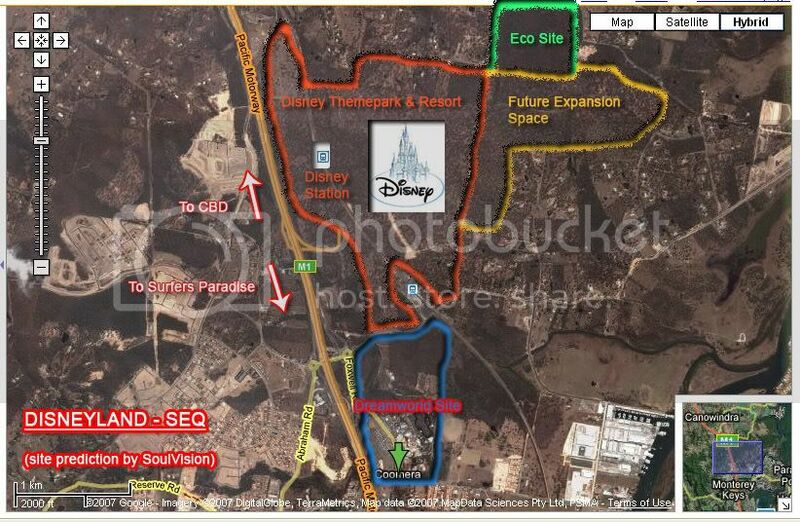 The new Disney site will be very close to Dreamworld. "Disney" will be releasing something soon, and to buy property in the Coomera area. It's going to create around 5000 jobs. Who knows, it could be anything from Disneyland to a Disney store... lol but that's what I heard! tell you what though, that would be the icing on the amazing cake in South East Queensland! fantastic stuff. I've heard from people that there's talk of a new park, though it's not Disney. I'd watch out for a different US company thinking of setting up here. That's interesting, any hints who it could be? Would love to see something like Universal Studios! Well sounds intriguing all the same. I'd love SEQ to get a big new park, preferably Universal but I wouldn't say no to Disney or any other big operator. With the Disney rumours, well they are rumours for a reason, so could be true, could be not. I will say this though, the Bizzy Bits column in the Bulletin is surprisingly good at picking up some property industry gossip that is meant to be below the radar, so I would say there is truth to the talk of Disney at least being interested, but interested, whether that amounts to more... guess we'll see, it would certainly be nice. I was told not to say parks, though it wasn't Disney. And I'm not saying what I heard was correct, but what the person told me was that Disney was not going into Australia within 5-10 years. Aren't we getting a little ahead of our selfs? Disney's train has ALWAYS been a loop around the park. Not a GOVT. owned train that would go straight thru the park?The Queensland Govt. would have to have access to the line 24/7 and I can't see disney having a 10 metre gap on both sides of the track, along with enough head room to support power lines. Also, don't forgot, big cranes need to go in to build the upgrade that's headed for the GC line, and Disney would need to have nothing on the top of the line.Also, who the hell is SoulVision? I did a Google search and nothing came up. 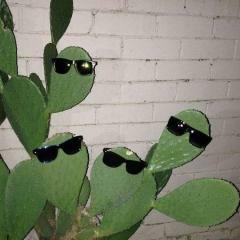 EDIT: Also, I found it funny that you managed to understand WWW_WORKER's post...haha you're very smart. It takes me about 5min mostly to work out when one sentence ends and begins. ^Well, it could always be set up so that the main road leading into the park would be on that easement. If there was a downtown disney type area it could occupy the western side of line. car parks would also be suitable to go there (that way all your transport related infrastructure would be together) The eastern side of the line would probably be entirely for the theme park/hotels. There would be no way you would build the park over the line, but separate stuff either side would work. That is of course if any of this actually came to fruition On an unrelated note, building stuff over train lines is entirely feasible, you don't need huge overhead clearances, and you don't need 10m gaps either side. Federation square is pretty much built entirely over the railway lines leading into Flinders St Station in Melbourne. Well I would assume ash that whoever drew up that image imagined that the train line could go underground, and by the time this thing was actually built, the dual line would have already been done. And basically, all the stuff above has come from here: http://www.skyscrapercity.com/showthread.php?p=15929977 which easily shows that SoulVision is a member of that site. The train line could go underground? So they think they would rebuild the line? (or the rise the land around it? I think the point is, there is a train line nearby and an 8 lane freeway right between two booming cities. This makes it an attractive location (well that's obvious given the parks already in this region). The talk of Disney coming to Aus has been bandied around for years. I think one of the main things that has been said, (and I think Richard said it best, though i'm not going to go hunting for the post now) is that the average attendances at all of our GC parks combined doesn't come close to that of a Disney park. Yes it would increase tourism, but I can't see it increasing that much, when most continents in the world have one now, and in some cases two. If someone has the time, can they dig up the post Richard made about attendances at a Disney park? Let's not forget that when WDW was built in Florida, all of the infrastructure support and logistics for the park were built on ground level, and the park built on top, and then the land was graded for a few miles around it. So rising the land around it would not be out of the question. When Disney does something, they don't do it half assed. As far as your prediction of 5 or 10 years, that doesn't mean to say that the rumors of talks now aren't out of the question. If we look at the timeline in the post above, we were talking year 2000 or so when they last spoke SE QLD, and they went with HK instead, and HK opened in around 2005, or 5 years later. So talks now would see the park built in 5 years or so from now... I have to say though, If Disney announce a park here, I don't care how much money I'm making when it happens, im quittin, selling up, and moving to the GC. Yeah, i would do the same & move north if Disney built a park up there. Hey Guys. I actually heard about these Disney Staff coming out to Australia not long ago from someone i know who works for the government. They Mentioned they were looking at land at Coomera and all the info that Ethan talks about is actually correct. I also read this article in last weeks paper and thought to myself..... Could this be true...... Well from all the plans in the past and rumors. It may be just another one to add. But in saying that.... I dont know anything else on this and its going to be kept TOP secret until its launched to the media from Disney. Not getting my hopes up.. But thinking positively I do think, that this "Rumor/goss or what ever its called" could be true and a great addition. Im going to keep my eyes peeled for anything in the papers or news in the future. I also read this article in last weeks paper and thought to myself..... Could this be true...... Well from all the plans in the past and rumors. It may be just another one to add. I ment to say I read it a while back, But people were talking about it last week around work and heard from friends. Dreamworld chief Stephen Gregg said while any new theme park was speculation at the moment, a competitive market was a good market and Dreamworld would welcome Disneyland if it set up on the Gold Coast. You've got to love them playing the "we're the good guys" card. I don't think that they realise that Disney's business strategy isn't to compete, it's to offer a flat-out superior product and then do everything possible to ensure that customers live and breathe Disney for their entire stay. Their entire pricing structure is designed about encouraging longer stays; the longer you're there, the cheaper it becomes (of course you're still paying more). You can guarantee Disney would demand their own transport network such that trains and buses to their property are direct and offer absolutely no chance for . You could, for instance, expect heavily themed buses to meet every incoming and outgoing flight at Coolangatta that take guests direct to their Disney hotel and vice versa at no charge. It seems a lot of you don't seem to realise that the hypothetical location that Ethan posted is a big hill, which is the only reason it is still forested and not redeveloped for farmland or housing. You also have to realise that Disney have been poking around here since the early 1990s. Serious discussions have always ended with governments here not prepared to meet the financial demands of Disney (they're after governments that'll bend over backwards to accommodate Disney -- see Hong Kong Disneyland). Don't think Disney are just looking here either. You'd expect that they are looking in dozens of other places around the world too. Parts of that land surrounding the current Coomera station and toward the top end of Dreamworld's land is owned by Westfield anyway. Both Westfield and MLE are putting their heads together to design the integrated town centre that will serve as the basis for future Coomera development. And by the way, I don't think Dreamworld is playing the 'good guy'. Keep in mind that Dreamworld is run by an Australia company that has been operating in that area of the coast for 20 odd years. And Dreamworld aside, MLE holds a pretty big stake in the future development of the Coomera area so they are more than within their rights to make a statement about increased competition within that area. Honestly though, what would expect them to say, "No, Disney should bugger off!" ??? And PS - MLE has based its operations on its own business model, so it would be well aware of what the introduction of a third pary such as Disney would do to the coast. Personally, I would like to see a Disney park in Australia, but if the expectation was that the Queensland Government was to 'bend over backwards' I think that sells the Gold Coast short. I think the best phrase would be 'tell em they're dreaming'. I think if Disney and the QLD Gov saw mutual potential in the development of a Disney resort then that would be ideal. That being said, if they are talking coasters in excess of $20mill, I'll go. And it could spark a development war that could really see our parks boom.